The Visual Fault Finder is a light source used to locate breaks, poor mechanical splices and damaged connectors in fiber optic cable. It's perfect to verify continuity, tests and finds breaks in fiber links, locate pinched fiber strands in termination cabinets, or anywhere fiber optic cables are terminated and subject to mechanical damage. 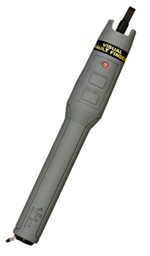 A hand held, battery-powered tool, the VFF projects a highly visible red light into a fiber optic cable. The operator simply looks at the length of cable, and where the light is seen, there is a break. The VFF is equipped with a high-power, extra long life, 650nm laser diode which operates in either continuous (CW) or Modulated(MOD; 1Hz Pulse) mode. A push button allows the user to select the mode while preventing accidental operation. Any breaks will be seen as a conspicuously glowing or blinking red light area (in 3mm or smaller cables). A red LED on the outer case echoes the operation mode selected. The VFF is useful over a distance of approximately 3km (2.3mi) into multimode fiber and 4km(2.5mi) into single mode fiber and can be used with single mode or multimode cable. Use it as a stand-alone first-line troubleshooting tool, or in conjunction with an OTDR to pinpoint faults. The unit is packaged in a pocket-sized, rugged metal housing and is fitted with2.5 mm universal connector that accepts ST, SC, and FC optical connectors. 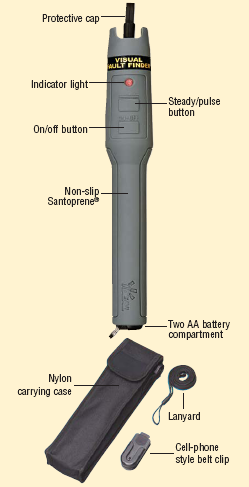 The VFF is also an excellent aide to technicians terminating mechanical splices or internal-splice style connectors where leaking light is an indicator of a poor fiber cleave or other misalignment.